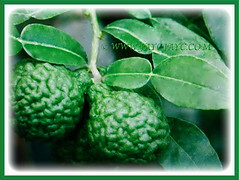 The Thai Lime produces edible fruits and leaves that are popularly used in Southeast Asian cuisine. 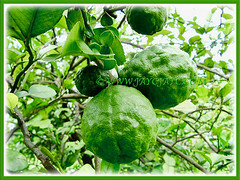 A must-have plant if you enjoy its fragrant limes and leaves to add flavour to your dishes. Its fragrance is absolutely flavourful and divine, to say the least! Botanical Name: Citrus hystrix (syn. : Citrus auraria, Citrus kerrii, Citrus papeda). 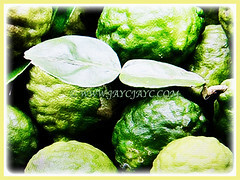 Common Names: Thai Lime, Kaffir Lime, Makrut Lime, Mauritius Papeda, Limau Purut in Malay. Etymology: The genus name, Citrus is from Latin word citrus, meaning citron tree. The specific epithet, hustrix in Greek meaning hedgehog, in reference to the thorns present on the plant. Plant type: An ornamental, evergreen and thorny shrub or small tree. Features: Citrus hystrix is a species of the genus Citrus that consists of about 31 accepted species of flowering plants. It is a thorny, multi-stemmed, evergreen shrub or small tree that grows to 1.8 to 7.6 m in height. This shrub has a spreading or sprawling growth habit. The evergreen leaves are glossy, aromatic and oblong but pinched in the middle so that one leaf looks like two ovate leaves fused together. Producing truly distinctively shaped foliage! Four to five petalled white flowers are showy and fragrant. 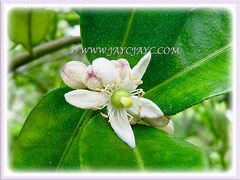 The flowers are followed by rough bumpy green fruits or limes up to 5 cm wide. It has little juice with a highly acidic flavour. The small-sized, round to egg-shaped fruit is rough and dark green, ripening to yellow. It is distinguished by its bumpy and very wrinkled texture. 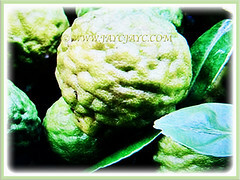 Culture (Care): Citrus hystrix or Kaffir Lime can be easily grown with minimum care. Moisture: Moderate water requirements. Water regularly especially during dry seasons. Soil: Best in humus-enriched, loamy and well drained soils. 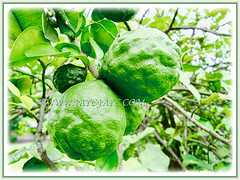 Others: Prune regularly to maintain a tidy shrub and encourage more fragrant flowers and fruits. Feed it once monthly with a balanced fertilizer for flowering plants. It enjoys a high humid environment. However, it is susceptible to root rot in overly moist soils. Citrus hystrix or Kaffir Lime will tolerate temperatures that occasionally drop to 0°C but will generally not survive temp much below that. This small tree prefers warm tropical to sub-tropical climates with abundant rainfall and sheltered from strong winds. In non-hardy regions, best to grown in a container and bring indoors in early fall to overwinter. An ideal indoor plant in a greenhouse. Propagation: By softwood cuttings or grafting. Can be propagated from seeds too. 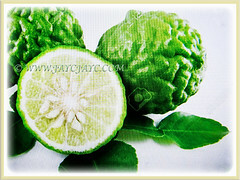 Usage: Citrus hystrix or Kaffir Lime with its edible fruits and leaves are popularly used in Southeast Asian cuisine. 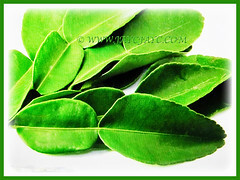 The lime peels produce essential oil that is used in perfumery, cosmetics and beauty products. Grow in your own garden to harvest its fruits and leaves to flavour your dishes. Excellent for container gardening in large garden pots on patios and terraces. 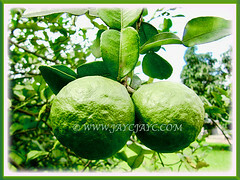 In some asian countries, the juice and rinds of the peel are used in traditional medicine as shampoo to kill head lice.